When it comes to art, there are plenty of ways for talented and expressive people to showcase their talents. From writing to painting to drawing to the popular and globally recognized ways like dance and acting, there is not a shortage of ways to express creativity. Numerous talents abound in the visual arts industry and David Hockney, the English painter and stage designer is definitely one of them. He has become an icon in the art world with several of his works getting sold for millions. In this piece, we learn about him and list five interesting things to know about the artist. Fame, success, and excellence have brought extensive detailing to the life of David Hockney. He was born on the 9th of July, 1937 in Bradford, England to parents Kenneth Hockney and Laura Hockney. His arrival in the life of the Hockneys made him the sixth member of a family of seven. David had modest beginnings, while he did not necessarily grow up in a poor family, he did not grow up in an affluent one either. David Hockney was connected to art at a very early age in his life and it informed his journey of formal education. After graduating from Bradford Grammar School, he attended Bradford College of Art where he had the opportunity of being taught by some of the notable art teachers in England, including the renowned Frank Lisle and John Loker. After he finished at Bradford College, he enrolled and studied at Royal College of Art in London. His reputation in the art community began to grow from his time at the Royal College of Art. He was part of the early movement of British Pop art which featured expressionist elements. His graduation from Royal College of Art afforded him a chance to teach at the Maidstone College of Art for a short period of time before he moved to Los Angeles in 1964 where he has spent the bulk of his career. David Hockney has been responsible for several iconic artworks over the course of his career. One of his first was a 1962 painting that was titled Life Painting for a Diploma. Other notables include Mr. and Mrs. Clark and Percy, A Bigger Splash, Peter Getting Out of Nick’s Pool, and A Bigger Grand Canyon. A lot of his works have been sold for several millions of dollars, including a 1972 painting, Portrait of an Artist (Pool with Two Figures), which was sold for $90 million and became the most expensive artwork by a living artist. It was sold in 2018. The celebrated artist is known to have a special interest in portraits and has painted over 700 of them, with over 300 of them being portraits of himself. Other mediums he has worked in include drawing, printmaking, and photography. He is also an accomplished stage designer. David has designed the stages of several notable theatres across Europe and the United States. From the Royal Court Theatre in 1966 to Los Angeles Music Center Opera in 1987, his work has graced several iconic theatres and he received the San Francisco Opera Medal in 2017 for his works. Even before it came culturally acceptable to be gay, David Hockney has always been a publicly gay man. Some of his works in the 60s were public celebrations of gay love and his own declarations of love for men. He has also been involved in a few high-profile relationships, including one with Peter Schlesinger. When it comes to artists, especially painters, exhibitions are the big spectacle; their big finales. 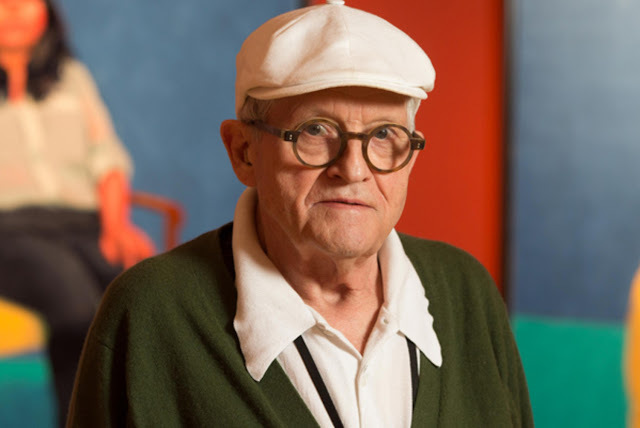 As a result of the volume of his work and the massive interest in them, David Hockney has had over 400 solo exhibitions of his paintings and drawings and he has had over 500 group exhibitions where his works were showcased along with that of others. Possibly unsurprising fact about David Hockney is he is a lover of cannabis. The legendary artist holds a Medical Marijuana Verification Card in California which allows him access to cannabis for medical purposes. When you are as accomplished as David Hockney, not only are you financially compensated for it, you get national honors bestowed upon you. The English painter has Honors such as the Order of the Companions of Honor and the Order of Merit. He is also a member of the Royal Academy of Arts. David Hockney has been using hearing aids for over 40 years for a medical hearing condition that began very early in his life.